This is not an official statement. It is just a prognosis. Think about it - you can always find a new Dark Side follower. But is it needed for him to look for and be sorry for Vader and almost cry on his helmet? Remember - no previous sith lord or apprentice has been interested in his predecessor. Count Dooku was not interested in Darth Maul. And Anakin was not interested in Dooku. And generally if a new Dark Side master is appearing, it is logical he will be intersted more in Palpatine, than in Vader. Palpatine is the previous symbol of the sith. So why someone will regret about Vader, unless somethnig is connecting them? The official trailer was released. From it we can see a desert planet looking very much as Tatooine. I.e. the planet where Anakin was born and later Luke has grown up. Why the Dark Side will need this forgotten place if not connected somehow with it? We can see also a girl (obviously one of main characters, 99% she will be a jedi) and a storm-trooper. So why the main character and a trooper will go to Tatooine, unless something happens exactly there? So if the father of Anakin is missing, Anakin is from Tatooine, and in trailer a Tatooine-like planet is appearing, so what follows...? Some time ago Someone working on the latest Star Wars production has been naughty and released a few concept images. How ever hard J.J Abrams tries to keep a lid on his latest production, the numbers are just stacked against him. To be fair it's not like he hasn't been supplying the fans with information. 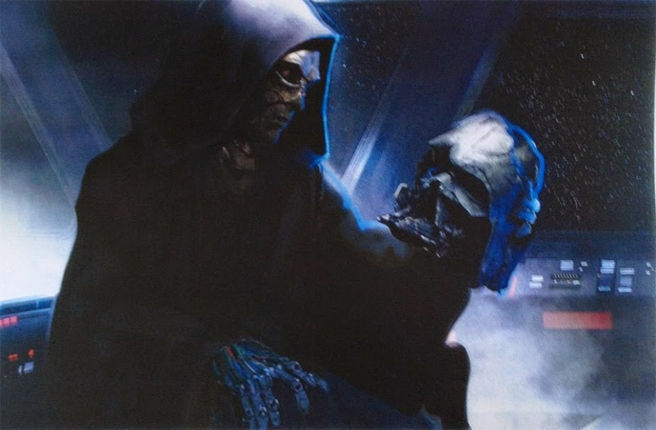 But it hasn't stopped someone working on Episode VII from revealing...... well lets just say a few concept images which do contain potential spoilers. Why would someone do this? Maybe the person had leaked the images it in a fit of revenge for not being supplied their orange mocha frappuccino? Maybe the person in question didn't like the direction of the storyline and thought the fans were entitled to know? Whatever the motivations were I think it is safe to assume that the person in question has now lost their job. So shouldn't we look? So that it makes his/her sacrifice all that more worth it?